The pregnant Virgin. A sandstone sculpture of the expectant Virgin Mary, made between 1400 and 1410 for the Bavarian pilgrimage site of Bogenberg, was later reproduced as copper engravings and sculptures. This early eighteenth-century reproduction is, unusually, an oil painting. It was copied from an engraving and fixed to a wooden panel that female supplicants probably carried in Catholic processions. Oil on canvas. 22.6 x 15.1 cm. Diocesan Museum, St Pölten, Austria. The sacred pregnancy. 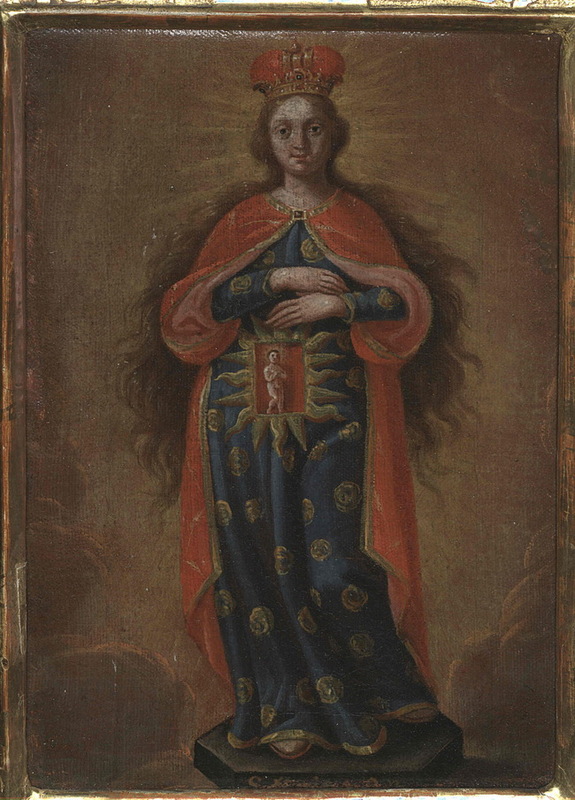 The most frequent representations of pregnancy in medieval and early-modern Christian art show the expectant Virgin Mary. Jesus, a child, is depicted inside her transparent belly or, in sculptures, within a niche closed by glass doors. In images of Mary’s visit to the heavily pregnant Saint Elizabeth, the little Jesus and John the Baptist rejoice in their mothers’ tummies. The cult of the pregnant Virgin, or ‘Virgin of the Expectation’, flourished through the late Middle Ages. But the Council of Trent (1545–63), reforming the Catholic Church in response to the Protestant Reformation, imposed a uniform orthodoxy that attacked such images as indecent. The open uterus in an Italian manual about pregnancy and childbirth. 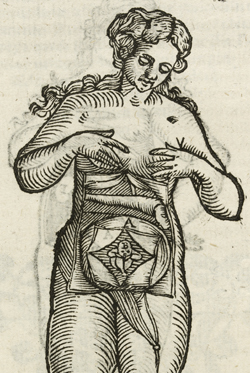 This woodcut from a seventeenth-century vernacular textbook on pregnancy, childbirth and women’s diseases shows a pregnant woman looking at her own opened belly. Unusually, and in contrast to other depictions of naked women in the book, the corpse modestly covers her breasts. The legend reads: ‘A) Open uterus of the pregnant woman, with the creature within. B) Head of the Creature, as it is inside the mother’s body, with the rest of the body.’ The term ‘creature’ is still used in Italian for children and for the unborn. From Girolamo Mercurio, La commare o raccoglitrice dell’eccellentissimo signor Scipion Mercurio: Divisa in tre libri, Verona: Francesco de’ Rossi, 1642, p. 18. 19.5 x 14 cm. By permission of the Syndics of Cambridge University Library. While images from the early 1800s strike expert modern eyes as merely abnormal, pictures and models from previous centuries are very strange indeed. 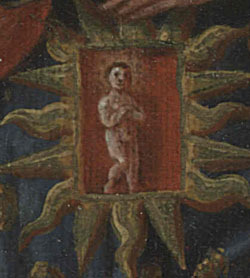 Representations from the later medieval and early-modern periods—roughly 1300 to 1750—show not a developing embryo, but other members of the diverse family of ‘the unborn’: Christ safely sheltered in the Virgin Mary’s womb, the coming child trying out different birth positions and a tiny homunculus contained in the head of a sperm. The images are so diverse because pregnancy and generation had such various meanings: the acquisition of an immortal soul, the making of family ties and the organization of unformed matter. The contents of the womb were mysterious to medical men and to women. 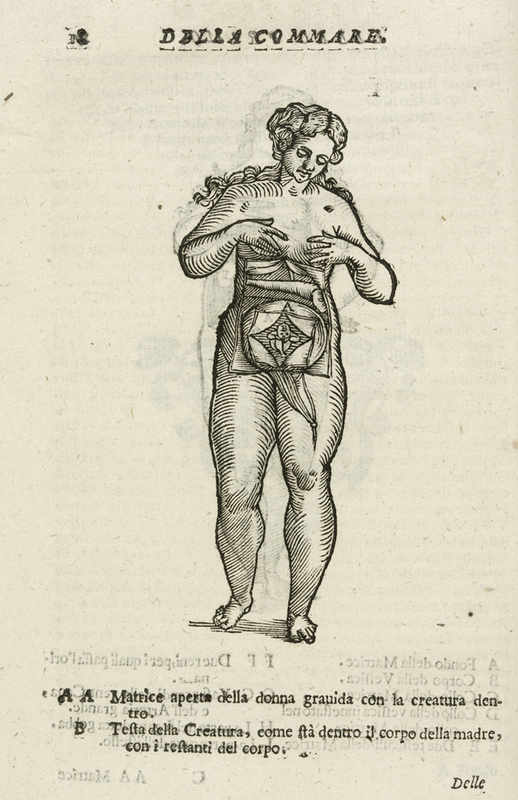 From the Middle Ages on, anatomists depicted adult bodies ever more realistically, but representations of the unborn remained largely schematic. Bodily sensations might convince women they were pregnant, but the existence of a child was hidden from the world and for the most part uncertain until birth.